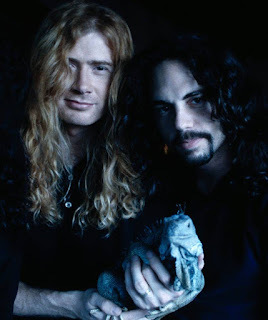 MetalRockNews: Megadeth's Dave Mustaine about Nick Menza's death: "Shocked, devastated, and saddened don't begin to describe my feelings"
Megadeth's Dave Mustaine about Nick Menza's death: "Shocked, devastated, and saddened don't begin to describe my feelings"
Megadeth's Dave Mustaine has released a statement about the death of band's former drummer Nick Menza. You can read the statement below. He wrote: "I woke up this morning to a text message from my son, with the news of Nick Menza's passing. Shocked, devastated, and saddened don't begin to describe my feelings. As a player, Nick had a very powerful jazzy flair, unpredictable and always entertaining. And as great a drummer as he was, the time spent with him as a person, a bandmate, and a friend was even more fun. There were several times we discussed him coming back to the band, but for various reasons it never came together. We've been in touch all along, he had come out to our shows recently, and he had remained a great friend, a true professional and a larger than life personality. My deepest condolences go out to Nick's family."